Last weekend, I drove from Tucson down to a long term ecology research site near Portal, Arizona. 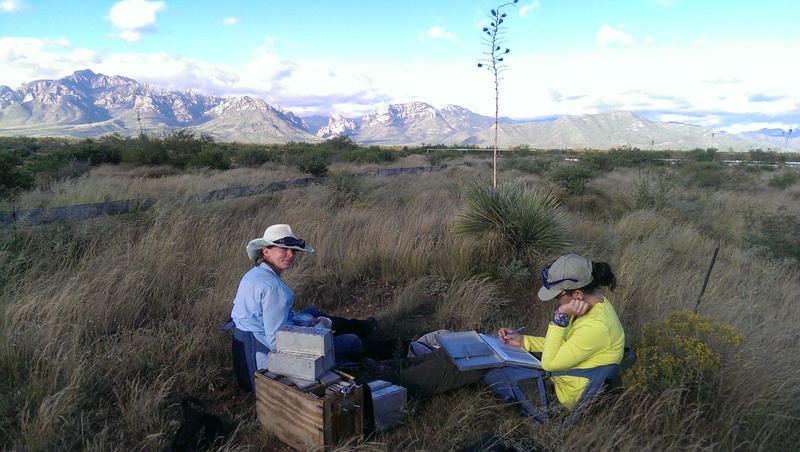 It’s a site started by Jim Brown in 1977 with a series of fenced plots that look at the effect of rodents on the plants of the Chihuahuan Desert, now run by Morgan Ernest’s lab. 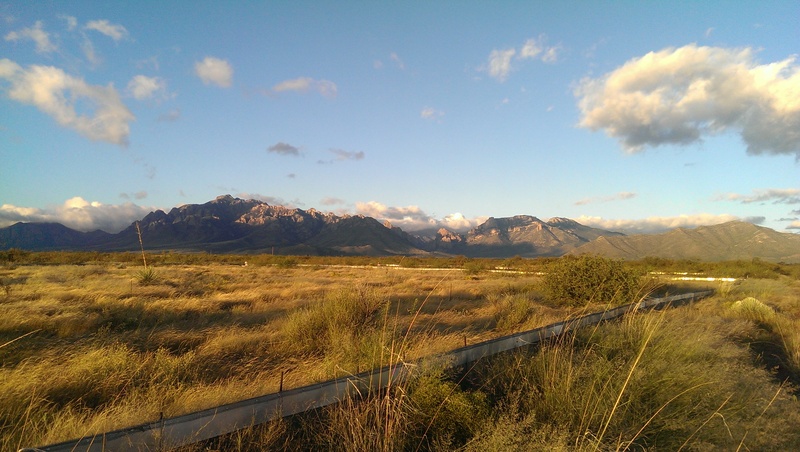 It looks substantially different than the Sonoran Desert that I’m used to, but still spectacular laid out at the foot of the Chiricahua Mountains. The Portal site with the rodent exclosures. Lovely spot for some smammal research. While I was setting up the cameras in the dark, I thought I heard the faint squeal of a truck’s breaks. It lasted maybe two seconds. But no headlights were visible in the dark San Simon valley. I heard it again and again as I walked around a quarter hectare plot, setting out cameras. It turns out the squeal is actually an itty bitty howl, emitted by the only genus of carnivorous mice. Yes, if you thought mice were scary before, just think of an aggressively hunting mouse standing on its hind legs to howl upward at the sky. They have short, stubby tails, and typically eat, well, grasshoppers, I guess. It is grasshopper season in Portal, and the horse-lubbers especially cover every surface, and are slow to move or respond. Easy prey. See that short and stubby tail? 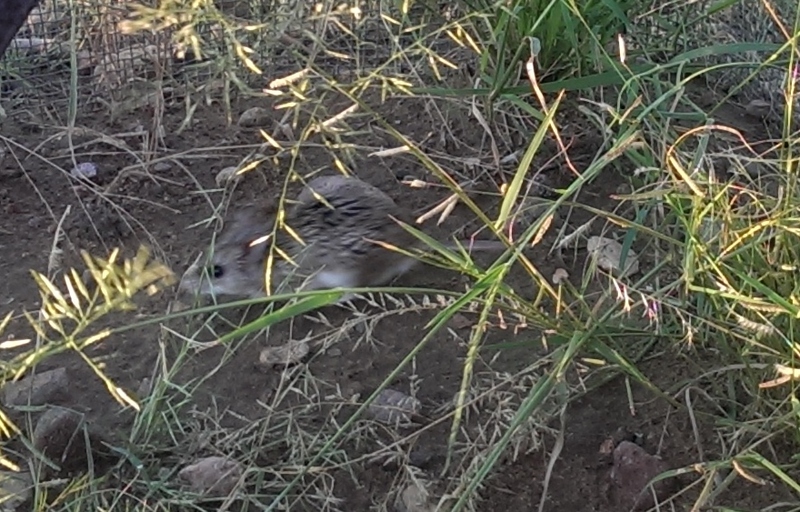 However, one of the other grad students had a story of releasing a Bailey’s pocket mouse (an animal weighing about 20 grams), and seeing a recently released grasshopper mouse (about 25 grams – not much larger!) seize it by the throat and drag it down a hole. They must be at least somewhat omnivorous (eating things other than meat), because we caught several in the Sherman live traps that were baited with millet seed. Racing quadrepedally through the grass. Wikipedia claims they have home ranges of approximately 28 acres and are very territorial, but we caught three in less than a quarter hectare. 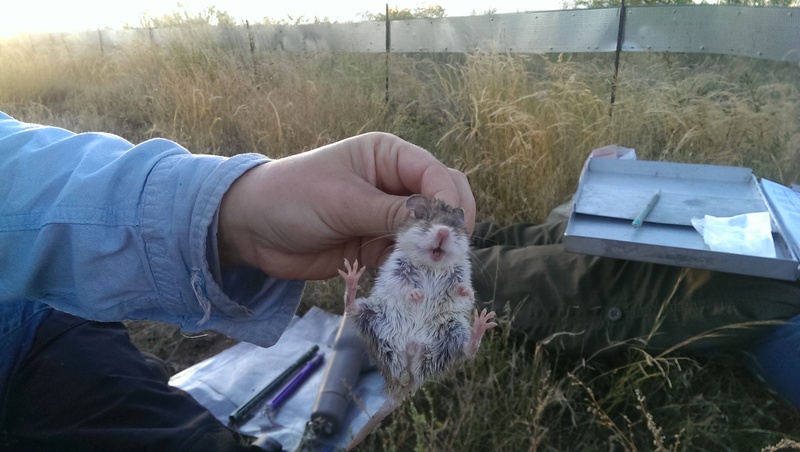 But they certainly move differently than the pocket mice and kangaroo rats that made up the bulk of the captures. Those others (in family Heteromyidae) are boing-y, bouncing around, like, well, a kangaroo. The grasshopper mice, when released, scurried off through the grass in a more fluid, slinky way, like a cat or a ferret, using all four feet and close to the ground. I plan to pick up my cameras next week. I look forward to seeing what video – and audio – I have of the unique species there. 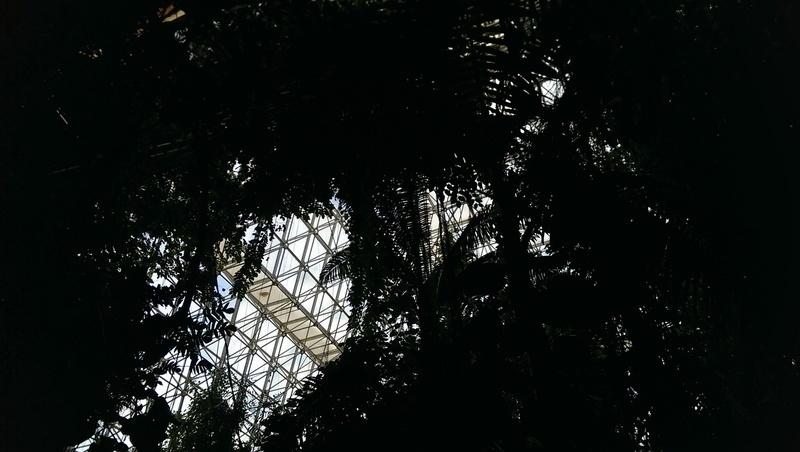 The first time I saw the Biosphere 2 space frame structure, it reminded me of a giant jungle gym. 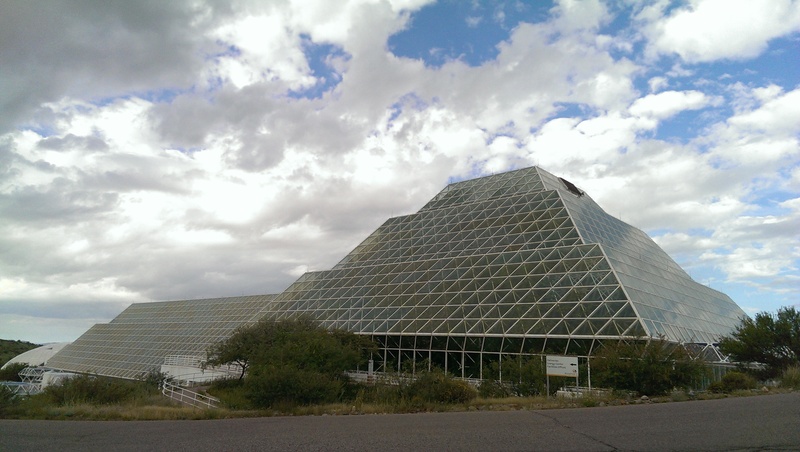 Actually, every time I see Biosphere 2, it looks like a giant jungle gym. I’m sure I’m not the only one who stares at it, imagining how to to climb it. It’s just that I finally got to. In my last post, I wrote about a summer excursion to the Brazilian Amazon to help with research on the future of the Amazon under climate change. 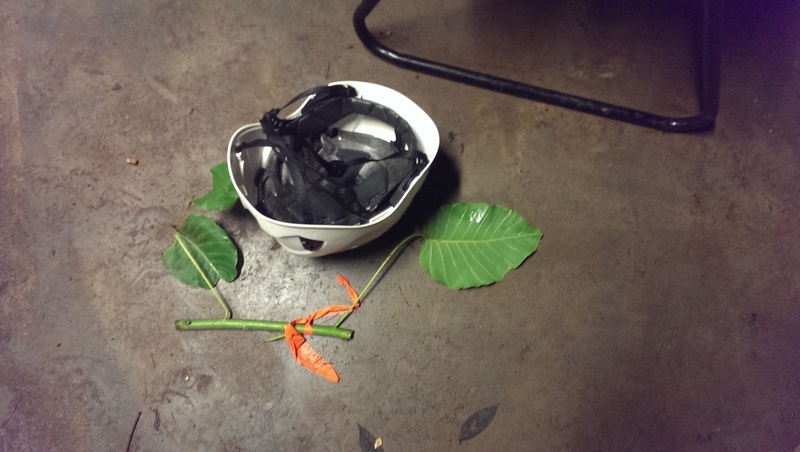 I was helping Neill Prohaska and other members of Scott Saleska’s lab and the GO Amazon project measure seasonality and reflectance of leaves, which is part of a larger effort to understand what would happen if the climate there gets hotter and drier. Similarities between taking measurements in the Amazon and measurements in B2: you get to climb and cut sample branches. Differences: everything else. 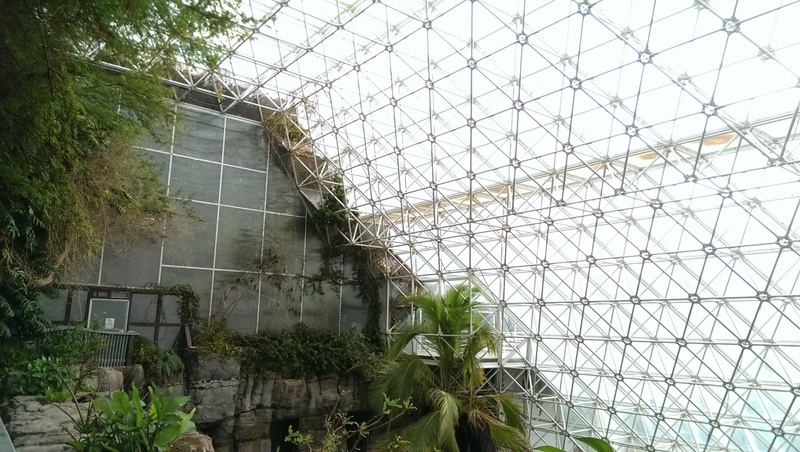 But back in the early 1990’s, Biosphere 2’s original builders included a tropical rainforest in their structure. Now researchers can do the experiment by creating a drought for an entire stand of living rainforest trees, which is tricky to do in the Amazon. In fact, they kind of already have. But Dr. Joost van Haren wants to know what happens to individual trees and to the system’s ability to photosynthesize and grow, storing carbon dioxide from the air, during a drought. 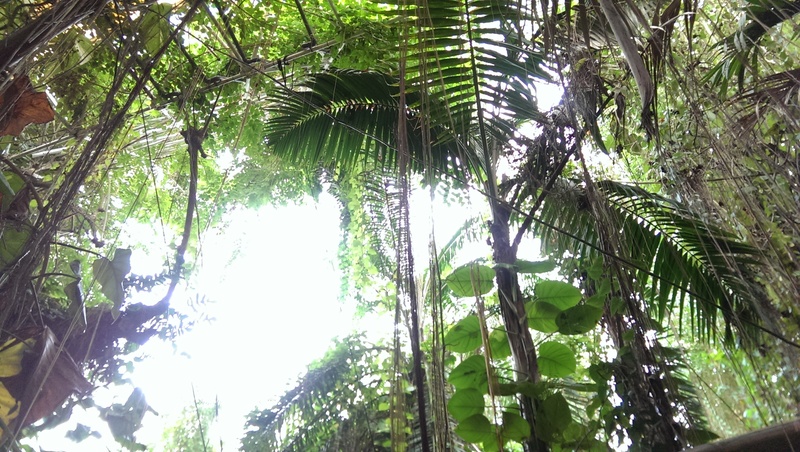 So for the last 8 weeks, the B2 tropical rainforest has experienced a drought. This weekend, I was part of a small team that helped take some vital rates of photosynthesis activity in the rainforest. 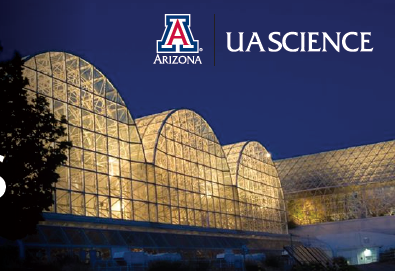 By far the most exciting part was the pre-dawn climb up through the space frame to cut sample branches. 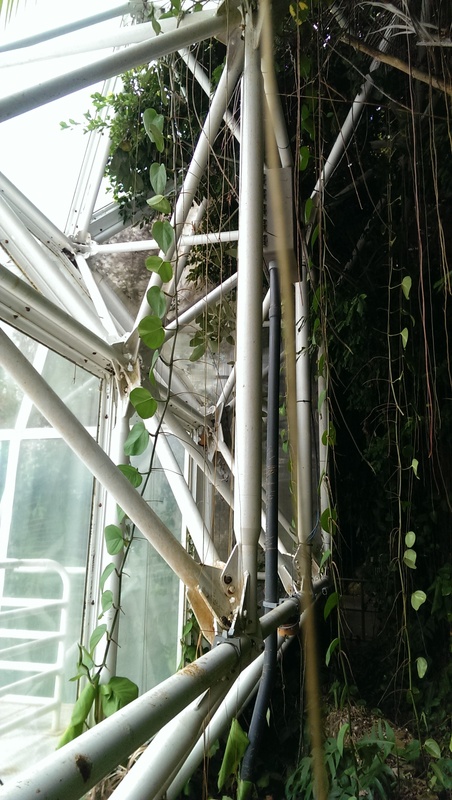 I was actually not helpful at all in this part – Neill scampered around the structure like a capuchin, while I moseyed upwards comparatively like a sloth. I didn’t cut a single branch. 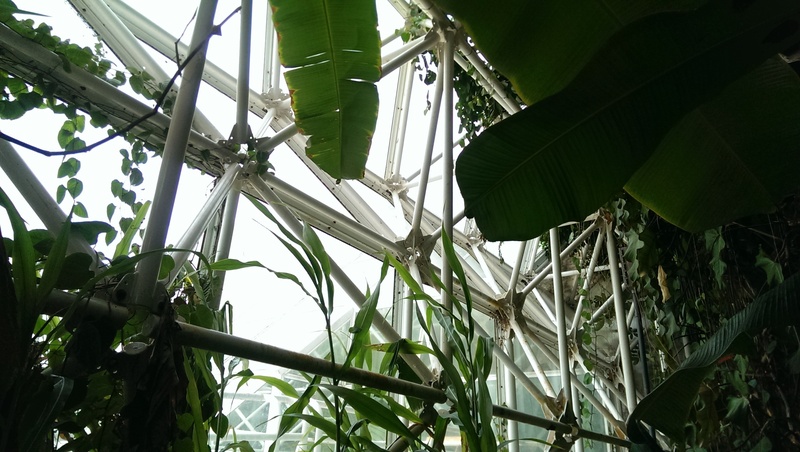 It turns out when you approach the space frame closely, the struts are a little bigger than your school yard jungle gym, a little slicker with condensation (even during the drought they were a little wet), a little more likely to be covered in vines to catch you…. and the whole thing is a little bit taller. And while we used harnesses and safety devices that clipped to these struts, these static lines would hurt to fall on, even if you didn’t break a bone hitting the bars of the frame on your way down. “Don’t fall,” Neill told me. Eek! I didn’t fall, even climbing all the way to the top of the rainforest section to watch the sunrise, where a bird flew in through an open vent and perched on the struts nearby. Check out the details and dates at http://www.b2science.org. Promotional photo from the flyer for Discovery Nights. It’s a neat place to chill after dark, not going to lie. All the cool cockroaches will be there.